Early yesterday morning, I awoke to my wife jumping out of bed. “Do you smell smoke?” She asked. Let me tell you, there are few things that will pull you out of that just woke up groggy state than a question like that. And, sure enough, I did. A quick check told me that there was no visible fire or smoke in the upstairs portion of our house. It wasn’t clear what the source of the smell was. I quickly ran downstairs to check the rest of the house, fully expecting to find a smoldering spot somewhere. Nothing. Down to the basement. Nothing. Back upstairs. Still nothing, but the smell is still there. I went from room to room, floor to floor, sniffing the air trying to pinpoint where the smell was strongest. The good news was that it wasn’t getting any stronger, but I still didn’t have source for it. The only thing that I can find is that the furnace doesn’t seem to be working. By this point, my wife has gotten the kids up, and is working on getting them dressed just in case we have to make a hasty exit from the house. There isn’t any immediate danger, I don’t think, but you just never know. It just so happens that a close friend is a member of the rural fire department here. We’re in the city fire department district, but it doesn’t hurt to ask, so we called him for some quick advice. I quickly fill him in, and he suggests that I call the city fire department and have them come check the house for carbon monoxide and also do a hotspot check with their thermal imager. I certainly didn’t have to be told twice, so that’s exactly what I did. A couple firefighters show up, give the house a quick once over and come to the same conclusion that I have. The furnace has gone out. And, for some reason, has filled the house with the smell that we awoke to. They can find no hot spots, and the CO tester is not indicating any CO threat. We cut the power to the furnace, and everyone agrees that there is no immediate threat. We can go about our business. Well, with the exception of calling the furnace repair folks in to figure out what’s wrong with the furnace. Some of you might not think it’s a big deal, but we still haven’t seen 30 degrees in March. The nightly lows are in the single digits. In just the short time that the furnace has been out, the temperature in the house has dropped 10 degrees. I called the furnace repair company, and, to my surprise, they sent one out right away. Luckily, I caught the guy as he was headed out the door for a call, so he could easily be rerouted to our house. A couple hours later, and we had a working furnace again. 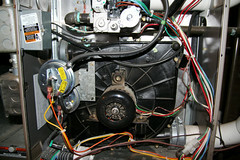 Turns out, the blower motor that pushes the air through the ductwork and into the house had stopped working. It lost its bearings. Literally. The result was that it started to leak some lubricant oil and actually melted some of the electrical work in its housing which is what made the stink. The company bills for the repair, so we only have an estimate as to what the cost of the repair will be. The repairman thinks less than $200. We’re lucky. We’re lucky, because our house didn’t catch fire. We’re lucky, because we aren’t trying to figure out how we can live out of a motel room until our fire damaged house can be repaired, or, worse, until we can find a new house to replace our destroyed house. We’re lucky, because we aren’t trying to figure out how we’ll replace any of our belongings. We’re lucky, because we’re safe. But, to a lesser degree, we’re lucky, because we can afford the repair. It wasn’t that long ago that an unexpected bill for $200 would have had us wondering if we were going to have to choose bills to go unpaid. But, we took control of our finances. We’ve got a long way to go, but, a $200 emergency doesn’t mean that a bill goes unpaid. And, that makes us feel safe too. Good you guys didn’t catch up fire! You are lucky, for all the reasons you specified! And it is stories, like yours, that motivate me all the more to preach to anyone whose path I cross that an emergency fund is so very vital. You “get it” and for that you should pat yourself on the back. This adds to the plethora of reasons that I’m a) terrified of ever being caught without an emergency fund, and b) terrified of home-ownership and all the associated appliances that are capable of turning on their owners. Happy you, the family, and the house are okay. Hope you stay warm! This has to be scary to wake up to! Good outcome though. Would a smoke detector have set off an alarm? @krantcents We’ve got smoke detectors and even a CO monitor in the house, but there wasn’t any visible smoke, and so not enough to have set off a smoke detector. If there ever was enough to have in the basement, it dissipated long before we went down there. @justin: in the time we’ve lived in our house, we’ve had very few events that come close to this amount of money. Overall, we’ve had a wonderful experience owning, and, all while paying at least $100 less a month than we would to rent a similar sized house. Thanks everyone for you well wishes! Awesome on all counts. (Well, except the furnace breaking.) I also love having that cushion that turns what used to be emergencies into annoyances. Glad to hear you are all safe and that your emergency fund had enough in it to cover the cost of the repairs. A great lesson for all of us. Speaking of which… we spent 4 hours in the emergency room last night trying to get a bead out of DS’s nose. Sigh. It did finally come out and I’m not looking forward to the anesthesia bill. If there’s one thing I’ve learned in my short existence, it is to never underestimate the female nose. Thank God everything was good. I am linking in the Comment Luv a post on what your insurance will cover. Nice to have the financial peace of mind that an emergency or unexpected expense fund provides. Good reminder to have a plan in cases like this.